The area along Silom Road, extending to Suriwong Road on one side and Sathorn on the other, is one of Bangkok's main business and financial districts. There's not much here to attract the tourist, aside from the red light district of Patpong and its associated night bazaar. However, it is centrally located and has a wealth of hotel offerings, so it's not a bad area to stay in. A number of the city's main tourist and business hotels are found along these roads. It is a relatively convenient location between the river and the main shopping area, with lots of options for food and entertainment in the evening. This convenience comes at a price, since most of the hotels are among the city's most expensive. 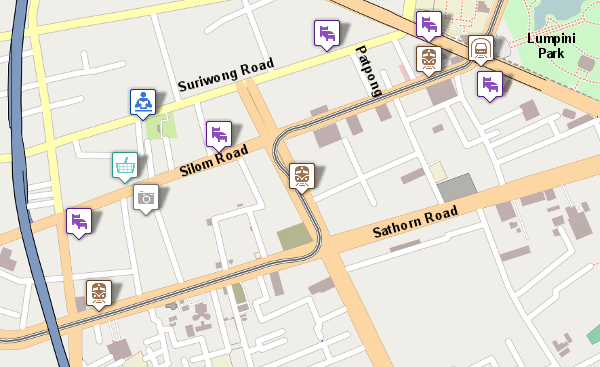 At the lower end of Silom is the Silom Village center. This small collection of souvenir shops and restaurants can be an interesting place to poke around in, especially if you are staying in the area. In the evening, classical Thai music is played for guests of the restaurant in the open courtyard. Upstairs is a sort of dinner theater where you can enjoy a Thai meal along with an abbreviated display of Thai dancing. Just up and across the street from Silom Village is the only purely Hindu temple in Bangkok. Built in the late 1860s by Tamil immigrants, the colorful temple now hosts the faithful of many nationalities. Walk up Silom Soi 20 opposite the Hindu Temple. You'll pass a relatively new mosque near the middle of the alley. At the end of the alley is the Nelson-Hayes Library. The rather elegant library in a shady compound next to the British Club houses one of Southeast Asia's finest English-language collections. The library was built in 1921 to honor Jennie Neilson-Hayes by her husband. The rotunda serves as a gallery space with frequent exhibitions. Chongnonsi Road bisects Silom roughly in the middle. This wide road has a canal running down the middle of it. Between Silom and Suriwong Roads, the canal has been covered with a plaza featuring a modern sculpture of a windmill. "Silom" means windmill in Thai, and the Silom area was once dotted with windmills. This was back when the area was mostly orchards.